When I was in my last year of college a friend of mine gave me this book. I was in the home stretch of school working full-time and going downtown to Columbia College full-time. I was still living at home so that made it easier. 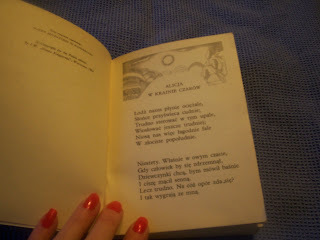 I had decided that I wanted to learn Polish because although my grandma spoke and so did my mom as a family we did not-just a handful of words. As a matter of fact for the longest time I thought that my grandma was born in Poland-she never assimilated. Barely spoke English, never learned to drive, always lived in a Polish neighborhood in the city, used Polish doctors things like that. It wasn’t until later that I discovered that she was born here and moved back and forth to Poland a few times living with her family there. It was great confidence on my part that I decided that I would learn how to speak Polish. I bought tapes and listened to them in the car. How hard could it be? I had three years of French in high school and one semester in college. Piece of cake! I will crank out the language in no time. That didn’t happen. The tapes were all over the board. I tried for 6 weeks and learned nothing other than the few words I already know. 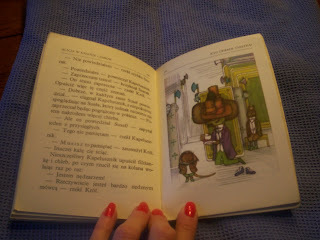 It was during this time though that my friend gave me this wonderful book Alice’s Adventures in Wonderland. 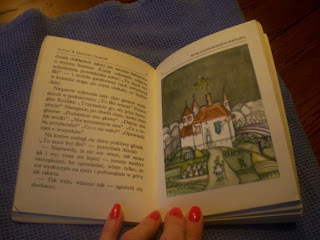 The illustrations are wonderful. The book was printed in 1955. This is the scene where Alice starts to stick out of the Rabbit’s house and he sends in the lizard. Is it too late for Rosetta Stone? 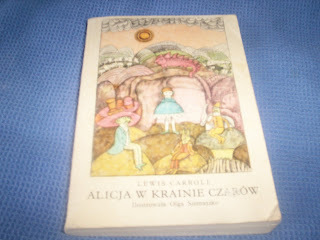 You are currently browsing the archives for the Alice in Poland category.